This entry was posted in environmental studies, Sci&TechStudies(STS) and tagged history, nativism, nature on March 6, 2016 by Peter J. Taylor. The history of ideas about nature can be read in terms of the social order being defended or promoted — see previous posts. 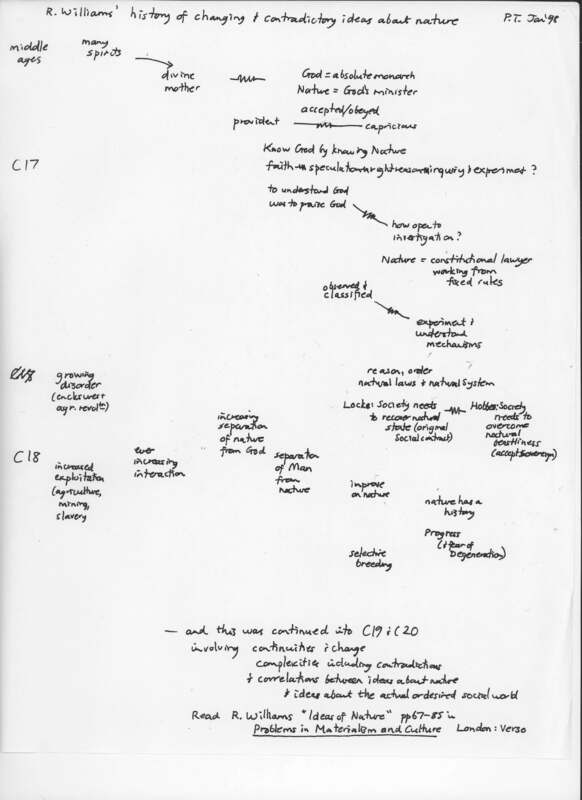 This post presents a schema of Raymond Williams’s history of changing and conflicting ideas about nature and what is natural. This entry was posted in biomedicine, environmental studies, Sci&TechStudies(STS) and tagged history, nature, social order on February 16, 2011 by Peter J. Taylor. This entry was posted in biomedicine, environmental studies, Sci&TechStudies(STS) and tagged history, nature, social_order on November 1, 2010 by Peter J. Taylor. Interpreta: That seems a very coarse way to take environmental and health costs into account…. The previous post ended thus. Continuing the three roles: Partovo (“Humans are a Part Of nature”); Separata (“Humans have become Separate from nature”); or Interpreta (“Interpret Socially views about nature and what is natural”). Interpreta: That seems a very coarse way to take environmental and health costs into account. In fact, you’re both claiming that analyses of ecological, health, and economic dynamics are too complex to be the basis of social decision making. This appears to be a claim about how the real world works. I know you’re not refering to nature — trees, animals, etc. — but just as I said at the start about ideas of nature, these ideas about the “real world” build in ideas about your favored social arrangements. Separata: And you think that such participatory planning is possible. That explains why you point to the unspoken messages behind our statements — you want to check the power of simple accounts of the ecological and social world and counter the rhetoric of crisis management that gets associated with those accounts. Partovo: OK. And now Separata is saying that this very interpretive stance of yours is itself subject to non-literal interpretation? Separata: It’s even more complicated than that. Interpreta has faith in the ability of people to understand complex processes and participate in decisions about investment and social policy. So he seeks to undermine our approaches and their implications about social action and to boost his approach. We’re all involved in intervening in social processes. Therefore, we should examine empirically whether my environmentalist rhetoric, Partovo’s developmentalist rhetoric, or Interpreta’s critical interpretations of us have the most impact. Furthermore, Interpreta, if you prefer the more complex, why do you focus on interpreting our more simple statements? Instead you should present to us some complex accounts of particular cases. At the very least, to help me get beyond “do not disturb natural balance” type rhetoric, I would like to know what ecological and social principles can guide our interventions with/in nature. While I’m on this roll, I think it would be better if you — together with a group of collaborators — demonstrated on-going, participatory planning and assessment. Or else, we would be justiied in interpreting your emphasis to date on critical interpretations as indicating your confidence in the political impact of ideas, words, and text. Could it be that practice is secondary in your framework? Interpreta: I think you’re both right to challenge me. Raymond Williams’ life’s work — and I have been taking him as a model today — focused on literature and politics. The correlations he draws between ideas people have about social and natural arrangements — I am impressed by them. But he does leave me wondering what people actually do so as to end up with such connected ideas. I’d like him to say more about the social interactions and negotiations through which humans come to know the world. Partovo: I hate this — now you are distancing yourself from your role model. Can’t we keep this simple? Interpreta: Yes and no. Let me observe that in this discussion a Williams-type perspective has opened up questions you had been avoiding, and it has exposed assumptions you were taking for granted. In this light, even if simple rhetoric and accounts — “(non-human) nature is in fragile balance”; “economic processes adjust investment and R&D choices to respond to costs and demands” — are sometimes powerful, wouldn’t it be better to have a more complex account to complement that? Furthermore, suppose you were simply committed to mobilizing people to act (or, in Partovo’s case to let corporate managers act for them), I think more complex accounts would be needed to help you understand when the simple rhetoric will be powerful. That isn’t always the case. And, even when it is, simplicity sometimes engenders unintended, undesirable consequences. Separata: Hold on. I understand the undesirable consequences of Partovo’s accounts — they help distract help corporations and the military avoid paying the full costs of their projects. But what are the undesirable consequences of drawing attention to the environmental costs of development? Partovo: Let me answer. Environmentalist rhetoric, especially of the apocalyptic kind, undermines people’s commitment to working hard to keep the economy thriving. Interpreta: Maybe, but that’s not what I had in mind. I suggest that you wait for Peter Taylor’s classes on neo-Malthusians, the so-called “tragedy of the commons,” and global models to see how environmental rhetoric can have undesirable consequences. Separata: OK, I’ll wait. But let me admit that I’m worried by where you’re leading us with your critical interpretations of ideas about nature. I now doubt your earlier reassurances that I have some alternative points of reference, namely, health and ecological sustainability. If one shifted to more complex analyses, health and ecological sustainability would start unraveling too. We would be left without any firm handholds. Interpreta: I don’t think that must be the case. But, to convince you of that, words and arguments are of limited power. I believe that we’d have to join in and experience some participatory processes of social governance. Partovo: We already do — we all vote in elections, right? I know that voters aren’t all informing themselves with analyses of “complex ecological, health, and economic dynamics” as you call them. But voters elect representatives whose decision making takes into account the advice of those to whom they delegate the tasks of analysis. Separata: You must know that that is a seriously idealized picture of how decisions are made in government. Partovo: Maybe, but tell me: Would you be happy if we moved towards this ideal of social decision making by elected representatives following the advice of environmental analysts? Would you — or Interpreta for that matter — accept an appointment as such an analyst? Interpreta: I’m afraid we’re too far from that ideal for me to make a well-informed response. Partovo: It’s easier to be a critical interpreter of the messy present, isn’t it? This entry was posted in biomedicine, environmental studies, Sci&TechStudies(STS) and tagged nature, politics, society on October 31, 2010 by Peter J. Taylor. Partovo: Agreed. But you should remember that some people move into such areas when the price of real estate drops to levels they can afford. That’s the way markets work to balance supply and demand. Dare I say, it’s a natural process? Interpreta: I suspected you would. And by that thinking it’s then natural or, one might say, acceptable, that the people who move into the area suffer the health costs, while the corporations that secured the military R&D contracts gain the profits. The general point I want to make is that almost everything that both of you has said in trying to defend your views about nature has been based on your views about acceptable vs. unacceptable aspects of society. So, Separata, I don’t think “nature” holds up as a point of reference for deciding what’s acceptable or not. Separata: But if not nature, what else? Interpreta: You’ve already told us what — for you it’s human health and ecological sustainability; for Partovo, it’s economic growth, with risks that can be distributed unequally among groups within society. Partovo: I might observe that the notion that we can plan for ecological sustainability in a complex world sounds as full of “unsupported assumptions” as Separata criticized me for having with respect to economic growth and technological development. Interpreta: Right — I’m glad Separata’s point sunk in enough for you to wield it in return…. Separata, you’re looking perplexed. What are you thinking? Separata: And you’re not for all development either. I think you like the vacations I’ve heard you take on the clean uncrowded beaches of Cuba. Partovo: (Sheepishly) And I’ve also enjoyed going with my family on nature tours in the Amazon and in Kenya. Separata: But, back to my worry. I have to reduce complexity if I’m going to get attention and enlist people into a campaign. It’s not until we have people involved that we can even get research done on the ecological dynamics — to establish how vulnerable the wetland is; how quickly it could recover from stress; whether we can create a new wetland on land developers don’t want. And that’s just the research needed on the ecological dynamics. Imagine if I had to research the economic costs and benefits before raising my concerns! Partovo: You could rely on developers to assess the costs and benefits. They wouldn’t go ahead if they were likely to take a loss. Separata: There you go again — you forget that corporations make sure that they don’t carry all the costs. They displace some on to other people and rely on not having to pay for loss of wildlife populations when development destroys the animals’ habitats. Partovo: OK, but let me echo your concerns. If we had to assess all the costs — present and future, social and environmental — of proposed projects, it’d take years before we could advance on new industry and other development. The economy would be greatly constrained. And we all need a vibrant economy. Partovo: … OK. OK. But that’s unavoidable. Anyway, egregious abuses eventually lead to reform legislation and government regulation. Interpreta: That seems a very coarse way to take environmental and health costs into account. This entry was posted in biomedicine, environmental studies, Sci&TechStudies(STS) and tagged history, nature, society on October 30, 2010 by Peter J. Taylor. Continued from previous post. Each person takes one of the three roles: Partovo (“Humans are a Part Of nature”); Separata (“Humans have become Separate from nature”); or Interpreta (“Interpret Socially views about nature and what is natural”). Begin the conversation as scripted, but call time out to discuss among yourselves any comment that you do not understand or that you would like to rewrite. If the group agrees to the rewrites and they diverge far from the script, record the new conversation you generate. Interpreta: Can I interrupt here? Separata, are you concerned by the fact that your reasons for getting in touch with nature are couched in terms of benefits to humans, and are not for the sake of (non-human) nature? Separata: I am concerned for non-human nature. Moreover, I’d like to break down the distinction. That is, in the long term I would like humans to live as if they are one part of nature among many other interconnected parts. However, I have learned through experience that most people will pay more attention to the environment only if I give them reasons in terms of human benefits. Partovo: You want humans and non-humans to be all part of nature. This sounds like the position I began with. And in this unified picture harnessing microorganisms becomes natural, no? Separata: You are giving me a hard time. Yes, beer, bread, etc. are OK. But don’t slip back to claiming that everything human technology produces is OK. Oil spills, for example, kill animals, devastate fishersies and that, in turn , threatens the livelihoods of fishing people. Partovo: Biotechnology is producing oil-spill cleanup bacteria. Separata: I think it would be better to prevent oil spills in the first place. Partovo: Maybe, but I’m not certain. Energy is vital to the economy. If oil companies were more heavily regulated and energy prices rose as a result, the economy would grow more slowly — and probably lose out to countries that accepted a greater risk of oil spills. Separata: It wouldn’t be so bad if economic growth were slower. Partovo: I suspected you might say that. But think — if the economy grew slower, there’d be less money for R&D. And we’d be less likely to develop the efficient solar cells and fusion power we need to reduce greenhouse gas emissions. In other words, the risk of oil spills may be just what we have to accept if we are to eliminate CO2 greenhouse problems. Separata: You’re making a lot of unsupported assumptions about where oil companies invest profits, whether the promise of fusion power is worth investing more and more billions, and so on. Partovo: I trust corporations to invest their profits well to make new profits. And I, like you, expect that science can produce results. Separata: I don’t have as much faith in corporate-driven R&D as you do. Or in Big Science such as nuclear fusion. Priorities for research should be for health and ecological sustainability — and not for military might or corporate profit. I mean, have you read the figures for the costs of containment and cleanup of wastes, chemical and nuclear, put into the environments around military installations since WWII? Partovo: I concede that mistakes may have been made, but the military didn’t only produce nuclear weapons and toxic wastes. Many technologies that you rely on are spinoffs from military R&D. Separata: Like teflon? I could do without that! Partovo: How about computers and the internet. Have you used email to organize an environmental campaign lately? Separata: OK — there are some benefits I accept, but go back to the costs. Someone will have to pay these, and that’s going to be a big drag on the economic growth you favor. Partovo: Maybe the costs won’t be so great if we just abandon the areas and let nature take its course. Separata: Not everyone can pack up and move away from toxic-contaminated sites. This entry was posted in biomedicine, environmental studies, Sci&TechStudies(STS) and tagged history, nature on October 29, 2010 by Peter J. Taylor.